You've been asking the million dollar question. Why music, and why music at home? I could write a hundred posts on the value of music as a social experience: how it allows us to concurrently celebrate unity and diversity, teaches societal norms, and promotes community as it weaves throughout our traditions and shared memories. I could write about the intrapersonal aspects: the way music promotes emotional intelligence, provides creative expression, and helps us cope. I could write about the way studying music has value in developing discipline and divergent thinking, and how it teaches us to excel and work toward goals. These are all beautiful things, and beauty is the realm in which music's value largely resonates. There is another aspect to the value of music. It is constantly on my mind as I teach music and as I focus on the developmental needs of my young children. Let me illustrate it for you. I bet you were really hoping to see a junior-high-quality Venn diagram with a brain growing out of a flower pot. Really though, as someone who's bought into attachment parenting theories, I think about my children's brain development all the time. I try to navigate a path that provides stimulation without too much stress. I plan how they'll get their omega-3's and wonder whether their brains are receiving enough oxygenation to retain what they learn. I think about the behavioral patterns I set for them, how I teach them to communicate strong emotions, and the effects of their natural inclination toward repetition. If you subtract the omega-3's from that last paragraph, I do all the same things for my music students. I try to balance rewards and stress to help them progress musically. I have them move when they are stumped or losing focus, and I place a high priority on teaching them to repeat with variation when practicing. Together we find ways to communicate emotion through music. 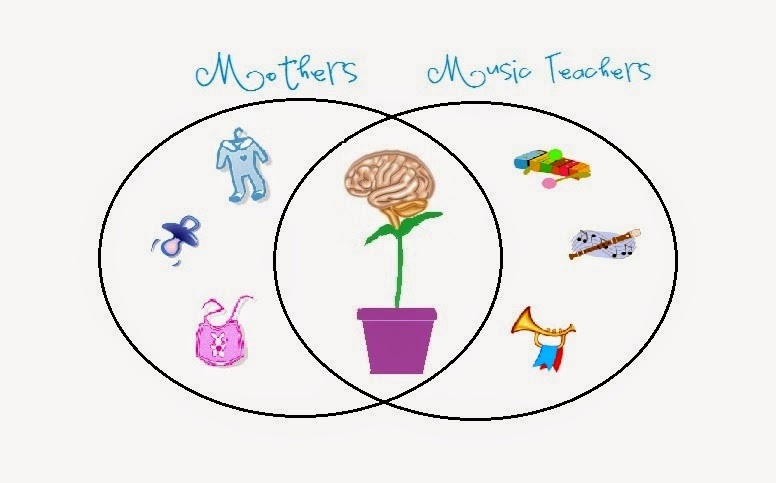 I use what I know about the brain to inform both my music teaching and parenting with what I hope will be similar results: a better brain, one that is both more capable and more resilient. So what do we know about music and the brain? For years, research has shown a positive correlation between the study of music and academic achievement. Studies have also shown that musicians' brains have more gray matter and more white matter, and that musicians use a greater portion of their brains than non-musicians. Not only is there this correlation, but we know that music study effects the neuroplasticity of children's brains in a way that causes these structures to grow. This translates to brains that are able to make more and faster connections. But, how does it work? The brain's neural pathways for music are made up of synaptic connections. The number of potential connections is highest in a child's second year, and then the unused connections are pared away until about age 16. These neural pathways are built and strengthened by experience and repetition which is why practicing is so important. With some of my students I use the metaphor of little relay racers that go from our eyes, to our brains, and down our arms to our finger tips. If our relay racers never exercise (practice) they will never get faster, but the more the run, the easier it gets. Because the brain prunes unused connections, early and frequent exposure to music are important. When children are fluent in musical experience, they will have much greater success studying instruments and participating in music groups. So please, sing lullabies, listen to music, dance with your children, and do all these things early enough for the brain to include their musical elements in its design. Mothers. Music teachers. We are growing brains. Everything is better with Venn Diagrams! Ha! I made this one late at night between turns in Hearthstone. The brain growing out of the flower pot is priceless.